I always wondered why somebody didn’t do something about that. Then I realized I was somebody. Everyone who can is helping and everyone should. My story is not unlike so many others, so instead I thought I’d share a few words about the power of giving back courtesy of some 11 year olds. In the aftermath of Hurricane Sandy, my daughters, along with some of their friends, have been looking for ways to help in any way they can. Our family was one of the very fortunate ones spared any real damage other than day-to-day inconveniences—rather humbling when I see the devastation all around me. So I was happy to have all of their friends over last week, because I was lucky that I could. Two days after the storm, they went through our closets and found coats and blankets that we could spare, shopped around in our local neighborhood stores for any relief effort supplies that were still on the shelves just days following the storm, and debated whether to use our car with the little gas we had left to deliver the items to the many drop off centers all around our area. The storm covered a lot of ground. We at least tried to cover a little. A quick stop to drop off blankets and cleaning supplies for the Rockaways on the East Side. No coats needed. Then onto the West Side to work at a drop off center at Riverside Church for those affected in Staten Island. The coats were needed there. My daughters and their friends “worked liked dogs” as my mom would say. By the end of the day, they had hauled bags of donated goods, taped up tattered boxes, sorted, packed, organized and lifted cartons…. and stayed outside in the cold November wind for many hours improperly dressed as we hadn’t planned on staying at this one place so long. Considering we were able to go home to our heated apartment, it was not such a big sacrifice. They even went on a “search and rescue”–for boxes. Supplies are great but only if you can pack them up, and the church had run out of packing supplies. Since garbage day is everyday somewhere in NYC, the girls were able to find boxes on the street waiting to be thrown out and picked up by the sanitation department. It was a real lesson in humanity and humility for these girls to dig through garbage for others. But they enthusiastically did it. Later that evening, my younger daughter snuggled in close to me—it had been the first time in a few days we were back to being “nice” to one another. A long week of nervous energy, close quarters and that sense of heightened vulnerability I remember feeling after 9/11 had been swirling. Tension and bickering were running high with everyone home from work and school. She leaned in and said to me rather tentatively, ”I had fun today. It was a good day. Wasn’t it?” And I knew exactly why she was so unsure about saying that but also why she actually said it….was she allowed to have fun doing what she was doing at the expense of those in dire need? I assured her that yes, it was a good day . Last Tuesday, Election Day, they were back at it again. A gas line snaked 12 blocks down First Avenue and passed in front of my building. It comes and goes daily as limited gas deliveries arrive and quickly get swallowed up. And the school next door was a polling site. 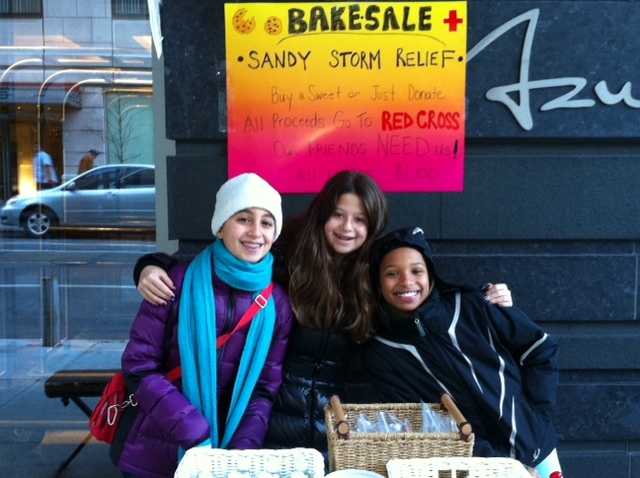 Knowing there would be lots of voters coming by and beleaguered passengers waiting on the gas lines all day, my city savvy daughters set up a bake sale with their friends in front of our building and donated their proceeds to the Red Cross. They stayed outside into the evening and wouldn’t leave their post until the last bag of cookies was sold. Again, another freakin’ cold night! I was more than ready to go inside but they refused. That night I got an email from one of the moms whose daughter helped. 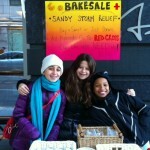 “Thanx for including us in the bake sale. I don’t think Amanda realized how much she would enjoy something like that! It was a great idea! She didn’t want to leave. She had a really good time with the girls.” It was such a simple, wonderful message. For whatever reason, volunteering, giving back, repairing made my daughter and her friend feel good. Whether it was the camaraderie, the adventure, some laughs, enjoying the air, they had fun and they felt good—they were busy, they helped, they experienced, they were with friends and family. They asked if they could do more. This weekend, they are heading out to clean-up areas with the help of our local councilwoman’s office. It’s funny. Karen and I just finished working on one of our chapters for The 52 Weeks, the book. The Giving Back chapter is all about how volunteering and giving back can make you feel better and get you going again. The insight I gleaned from my daughter, her friend and my own experience reconfirmed how true that is. Being a part of a community, keeping busy, helping others in need also helps yourself. Experiencing new places and things and yes, even having some fun too, is so very important whether during times of crisis or during the good times. It’s important to remember that. Please continue to help in any way you can.